Product #17019 | SKU 58DIGEK3 | 0.0 (no ratings yet) Thanks for your rating! The Tiffen 58mm Digital Essentials Filter Kit contains all the basics that an outdoor digital shooter requires. UV Protector These are wise initial investments. They help protect your valuable investment from dust, moisture and scratches, which can lead to costly repairs. Circular Polariser Light rays which are reflected become polarised. Polarising filters are used to select which light rays enter your camera lens. They can remove unwanted reflections from non-metallic surfaces such as water or glass and also saturate colours providing better contrast. The effect can be seen through the viewfinder and changed by rotating the filter. The filter factor varies according to how the filter is rotated and its orientation to the sun. 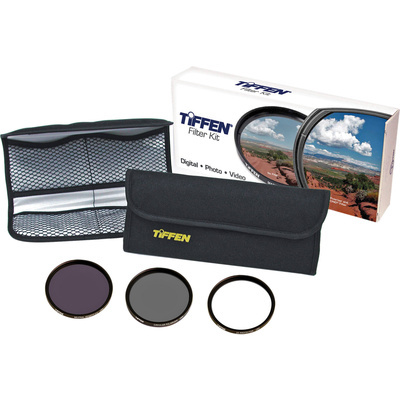 Neutral Density Neutral Density filters from Tiffen have several uses and offer the possibility to achieve otherwise unachievable results. They enable the shooter to adjust exposure without affecting colour balance. ND filters appear gray and reduce the amount of light reaching the either the sensor of a digital camera or the film plane of a traditional film camera. Neutral Density filters are used to create some unusual special effects such as capturing the "blur" of the rippling water of a waterfall or the swirling effect of city traffic. Since they allow the use of slower shutter speeds in bright light, it becomes possible to create these special effects that would normally not be possible to capture without the filter. And since they can also help to control your depth of field, they permit you to shoot at wider apertures. Ultimately, their value is in helping to prevent bright, overly washed out images shot in bright light.The entire kit comes with a Tiffen padded storage pouch that will help keep your filters clean and free from dust, dirt, fingerprints and other contaminants,. Tiffen's ColorCore glass is produced through a process that entails permanently laminating the filter material in between two pieces of optical glass that are ground flat to tolerances of a ten-thousandth of an inch, then mounting them in precision aluminium rings.